2. 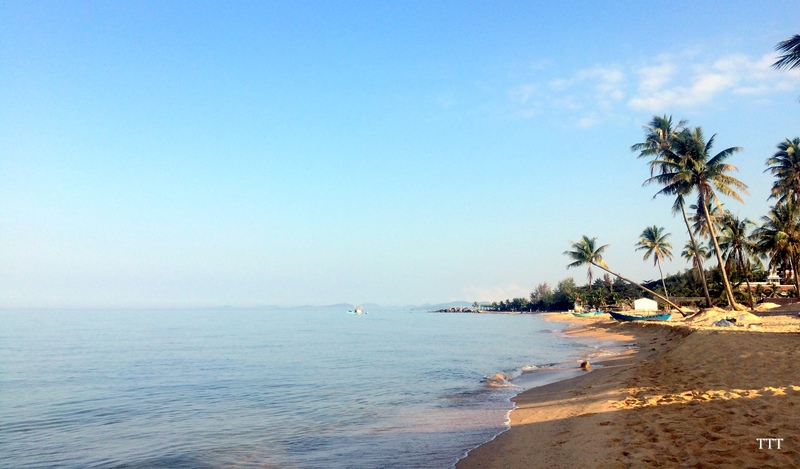 Beach: Phu Quoc has beautiful shores. I was only in Phu Quoc long enough to discover the South of the island. Sao beach is a beautiful beach where the long coast is filled with white sands and gentle slop to the sea. Following dirt roads to the entrance, you might feel it is strange when the entrance of the beach is the entrance of the restaurants. Do not hesitate to enter, even though you might just want to enjoy the beach. You can rent a bench for VND200k, or a hammock for VND100k to secure a place to rest in the shadow. Or you can also just lay down on the beach for free and enjoy. Watch out for jelly fish when planning your trip to Phu Quoc. The beach in front of my resort was filled with jelly fish when I was there. Not all jelly fish makes you feel itchy, that is the good thing. However, the feeling of having jelly fish everywhere when you are under the water is kinda gross. 3. Transportation: Roads in Phu Quoc are hard to handle by motorbike. There are a lot of pathways, dirk roads and roads under construction. For your own safety, riding motorbike is not recommended, especially if you are not a veteran motorbike rider. 4. Seafood: Having seafood, especially sentinel-crab, is a must. Sentinel-crab (in Vietnamese GHẸ) is alike the crab but smaller and having thinner cover. You can find seafood in different places with different prices: local market, the wharf, restaurants and night market. Some hotel and resorts do help you to cook and serve seafood that you buy outside with a fee. Dinh Cau night market is super crowded at night with tourists enjoying seafoods. Check out the prices before you choose whatever option. 5. Tourist attraction – Ham Ninh fishing village. Ham Ninh wharf is almost 2kms long. Walking along the wharf, you can see boats boarding, people catching and selling seafood on the spot. Sentinel and snails are sold at a very good price. I bought seafood from a nearby store and asked people there to cook them with the fee of 40,000 VND. That was such a local experience of eating local food. 6. Tourist attraction – Phu Quoc prison or Coconut Prison. Phu Quoc prison was first built by French to keep insurgents. During the American War, the prison was expanded to hold up to 40,000 prisoners. They were suffering extremely cruel punishment and treatment. On the site today, there is an exhibition house with images of prisoners and their belongings found after the prison was torn down. Part of the prison is now rebuilt for tourist purposes. The area is surrounded by multilayer of wire fence. There are houses made of corrugated iron to display prisoners’ life. Some torturing methods are also rebuilt such as tiger cage, discipline room, etc. Visiting the prison is to see how cruel the war was. 7. Local business: Tourist is the major business in Phu Quoc. Resorts are built to take advantages of the long and beautiful coast. But Phu Quoc does not only have tourist in its portfolio. People know about Phu Quoc for its fish sauce – one of the signature sauces of Vietnam. Rhodomyrtus, a wild tree, has its fruits put in production for juice, wine and other herbal medicines. Pepper in Phu Quoc is famous for its strong taste. Mussels are professionally fed along the coast for pearls, which are beautiful and diverse in color in Phu Quoc thanks to the composition of water. All of those businesses are open to public for your visit.